When Thelma “TAG” Martinez was diagnosed with ALS in 2013, she was 65 years old. Her caregiver and husband of 46 years, Henry, quickly became involved in the services provided by their local chapter. “On day one of this diagnosis, there is no data dump which tells the patient, ‘Okay, here is everything you need to get through the next few years,” Henry said. The two immediately found solace in the variety of care services programs provided by The Central & Southern Ohio Chapter free of charge. “They [The Chapter] became a resource for information, assistance, and more. The monthly support group meetings helped me and kept everyone else going. When obstacles arose, a phone call to the office brought swift assistance,” Henry said. 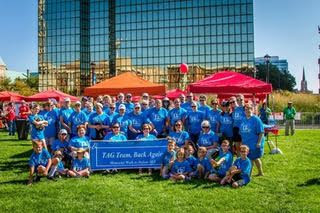 In the fall of 2015, Henry and TAG pulled a team together for the Columbus Walk to Defeat ALS® to help fund the services they were finding so necessary. In their first year, TAG Team raised more than $7,700, surpassing their goal set at $4,000. The following year, they came back stronger, doubling their 2015 total funds raised. Shortly after the Columbus Walk to Defeat ALS® in November of 2016, Thelma “TAG” Martinez lost her battle with ALS. For the 2017 Columbus Walk, Henry made a simple promise to the rest of TAG Team: if together they raised more than $10,000, he would match it. On September 22, 2017—two days before the Columbus Walk to Defeat ALS®—Henry Martinez matched TAG Team’s fundraising efforts with a gift of $10,000. It would have been TAG’s 69th birthday. As it turns out, that same day TAG’s grand-nephew made his way into the world. “We felt this would be an appropriate birthday gift in her honor,” Henry said. To date, TAG Team has raised more than $46,000 to support programs and services for those living with ALS and their families. “This organization was invaluable to us and that is why I support them in any way I can—by volunteering, continuing with the support group, and making sure that TAG Team continues to honor her memory by walking and raising money every year,” Henry said.